Hi there, physics lovers! Physics Buzz has temporarily headed south... to gorgeous New Orleans for the APS annual March Meeting! Just a little too late for Mardi Gras, we’re being kept very busy with over 7,000 talks in 5 days, plus press conferences and workshops. We'll be posting about the interesting talks we see and all the additional excitement. I’ve already seen talks on the physics of motorcycles, new theories about the interior structure of Jupiter, the physics of snake movement (which included a video of snakes in jackets! ), and many others. Keep posted for more news. The March Meeting is primarily an opportunity for physicists to share their research with other physicists in their field. Every once in a while, it’s also a chance to reveal a major discovery that affects more fields of physics or even the world at large. One press conference focused on some of these major breakthroughs and included a talk on the creation of gold, lead and tin fullerenes. 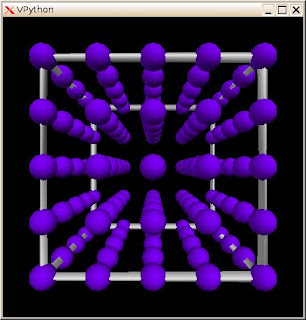 Physics Buzz recently had an article about the first team to image carbon fullerenes, better known as buckyballs, or tiny soccer-ball-like cages made of carbon atoms. These cages don’t exist in nature, and are made up of only 60 carbon atoms each. Sculpture on that scale is very difficult; we’re talking about specifically manipulating the structure of just a few dozen atoms! Lai-Sheng Wang presented his group’s creation of cages made of lead, gold, and tin. These metals all have very different properties from carbon, and will offer new applications as the science develops. Almost before researchers found they could successfully create these cages, they were working on how to put things inside them (which the team successfully did). Putting an atom inside a cage that is made up of another type of atom can alter the cage material’s chemical properties. 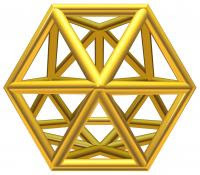 It also offers the possibility of using the fullerenes as atomic transports. Some people are focused on other things when they come to the March Meeting. Here is the Editor in Chief of Physical Review, Gene Sprouse, showing off mad skills (just kidding of course. Although Gene is a very talented yo-yoer, he spends most of his time keeping the journals running strong). Another breakthrough was the development of 3D optical lattices consisting of individual atoms, in which the atoms are far enough apart that they can be individually manipulated without disturbing their neighbors. David Weiss presented the data from Penn State. Imagine making small cubes out of toothpicks, held together at the joins by balls of clay. You could put a group of these together to then make a larger cube looking somewhat like a square jungle-gym. This is essentially a lattice, and scientists have found ways to put a single atom at each joint (where the balls of clay are). The atoms are then equally spaced apart, and take up a 3D space. Now that you’ve got those atoms where you want them, the objective is then to manipulate them. But the challenge thus far has been manipulating single atoms without disturbing their neighbors, which had to be very close by. The scientists were able to separate the atoms by 5 microns. An additional press conference focused on the physics of climate change. There were no ground breaking discoveries to be reported in this field, but rather an underlying message from the six speakers: physicists must develop more qualitative and robust ideas about climate models if they can hope to make predictions about future climate trends. While scientists are, unquestionably, able to observe climate changes, they cannot yet create a system model that will determine why these changes occur, or give any indication of future trends. Quantitative methods are all but impossible to obtain because of the scale they need to be on (the entire frickin Earth!). Speakers noted that there are few, if any, sessions at physics meetings being focused primarily on climate change. There is only one session focused solely on climate change at the March Meeting, and they hope that number will increase at future meetings. Shortly after the meeting, I’ll be posting an interview I did with Daniel Goldman about his research on animals that move on granular surfaces like sand and mud. He and his team built the sandbot to mimic this motion. The group thinks they’ve found some fundamental similarities between the way very different animals move on these surfaces (some of them moving at over 2 meters per second!!). It’s a wonderful example of how physics may answer some age-old questions posed by biologists, but also how physicists can learn fro nature’s living models. And of course, it raises new questions for both fields. Stay tuned physicsbuzzers!! More to come! Entropy. / My opinion /. Henry Poincare named the conception of "entropy "
as a " surprising abstract ". entropy monotonous increasing law remains open ". nobody knows, what "entropy" basically is ". in thermodynamics " The energy conservation law"
irreversible, but I am sure that " The energy conservation law"
process. So, how can I save this law ? of the total energy in the system which never disappears . body to the warm one. I will call this conception as " entropy"
" Clausius is right. But I can add more to his entropy conception. at thermal equilibrium (in the state of death) all the time. The situation in the system must change. of the system will change. mechanical motions of all the particles (k)." I will call it as " The second law of Thermodynamics." Clausius and Boltzmann are both right. Thermodynamics " is not completed, is not final. Please, look at the graph of the radiation curves of the " black body". equilibrium. What to do? How to be ? hv = k log W.
to accept this formula and to understand it essence . It was hard for me to believe in my own discovery. How to understand this formula? Which process does formula (hv = k logW ) describe ? of a physical system (of ideal gas ) could be discreted. In 1900 Planck followed Boltzmann's method of dividing. - " Planck's action constant"- (h) . Its energy is: E=hv. In which reference frame does this process take place? black body (Laue called this model as Kirchhoff,s vacuum). the situation in the real Vacuum (T=0K) very well. the particle /electron, which has energy: E = hv. Which process does the formula (hv = k logW ) say about ? the beginning conditions of star formation. One physicist said :" The entropy is only a shadow of energy“. Maybe now somebody can understand why entropy is a shadow.
" The Law of conservation and transformation of energy"
is also correct for thermodynamic system. It took me only two months to write this brief article. Plus about three years searching for the key of entropy problem. of physical laws and formulas.